Get Involved » Thank you shoppers! Thanks to shoppers at Whole Foods Market on Robson Street, $1,158 was raised for SPES’ conservation and education programs. Through the Whole Foods’ Community Chest program last fall, shoppers to the store could make a 10 cent donation to one of three charities if they brought their own shopping bag. Many decided to donate to SPES and 11,858 (paper) bags never left the store. Thank you shoppers and Whole Foods! 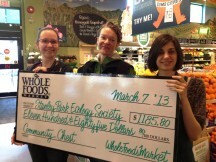 Whole Foods Market on Robson Street has been a loyal supporter of SPES for many years. The company has donated hundreds of bags of organic corn that our volunteers pop and sell at the Cob House, SPES’ fundraising venture in the Miniature Railway Plaza. The proceeds from the kernels have raised over $100,000 in funds for our projects in Stanley Park.